Nein, Surly Brewing’s Imperial Smoked Dunkelweizen, is supposed to have smoke in it, and I guess it does. It smells sweet, smoky sweet, and tastes alright. It’s a sweet, smoky, dark, wheat beer with a slight campfire taste. It’s frothy head fizzled quickly. I’m not getting the cornucopia of flavors I was expecting, but I am getting some flavors: brown sugar, beechwood smoked malts, leather, wheat. Well, maybe that is a cornucopia. This beer is sweet like a great wheat beer is supposed to be, and NOT as if someone dumped a bunch of syrup into it. This is a good beer, a good smokebeer, although I am clearly not able to really hone in on the smoke all that well. I recommend this beer. Homebrewers, I encourage you to go out and clone this one. Overall = 5 out of 7. Brewer’s Description Our ninth anniversary beer. All of the malt in this anniversary beer comes from Weyermann Malting, a family-owned operation in Bamberg, Germany, which is the center of Rauchbier (smoked beers) in Germany. The inspiration came from a trip that head brewer Todd Haug took to Bamberg to visit the Weyermann facility. 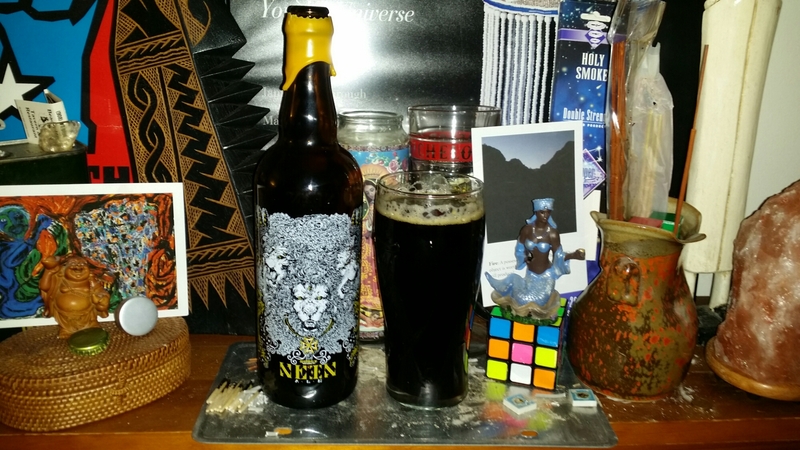 NEIN draws from the traditional banana and clove notes of hefeweizen yeasts and layers on deeper toned malt flavors, a distinctly smoky character from oak-smoked wheat malt and charred “honeycombs” of white oak. Bottle artwork description Erica Williams, our 2014 Featured Artist, who also designed the artwork for Darkness 2014 and SurlyFest 2014, designed the artwork for NEIN. Her three-headed, three-eyed lion represents Surly’s 9th anniversary. Image | This entry was posted in Beer, Educate, Enlighten, rauchbier, Smokebeer and tagged 5 - 6, ale, beechwood, dunkelweizen, imperial, Minnesota, Surly, wheat. Bookmark the permalink.